You know those recipes that just really don't work the first time you make them? They may promise to be simple, even quick, and then they just don't turn out. In my kitchen, I often have trouble with desserts that need to be cooked on the stove and then need to set. I've made my share of too-thin creme brulees (and served them anyway! ), unsatisfying rice puddings and too-soft fudge. Whereas cakes, cookies and muffins are usually a failsafe, I feel like I don't have the knack for cooking a creamy dessert properly. When kids are with you at the stove, it's a great lesson: your cooking isn't going to turn out the same way every time. It's another great reason to bring your kids into the kitchen with you as often as possible. When they see the mistakes, as well as the successes, they can learn how to change and fix things as they cook. And of course, cooking isn't about having a 'knack'. It's about learning the proper technique and practicing it. This recipe is a chocolate pudding with very few ingredients that is cooked on the stove and then set in the fridge for a few hours. The bit I find tricky in all these creamy set desserts is cooking the mixture on the stove for the correct amount of time - until it is the right consistency to set up properly later. There are various ways to thicken liquids while heating them - this pudding recipe uses cornstarch, and other desserts involve egg yolks or gelatin. No matter the vehicle, I seem to always have difficulty. I think my error is typically that I don't cook it for long enough. I'm a big advocate for cooking with all five senses and teaching yourself and your kids to cook by hand and by feel; learning basic techniques and making food from whatever you have on hand will take you through more delicious meals than only learning recipes. All that said, when a recipe tells you to cook it "until it's thick enough to coat the back of a spoon", I wish for a more precise instruction. I own a candy thermometer for this exact reason. I've cooked many a recipe until I thought it was "thick enough to coat the back of a spoon" and it didn't set later. 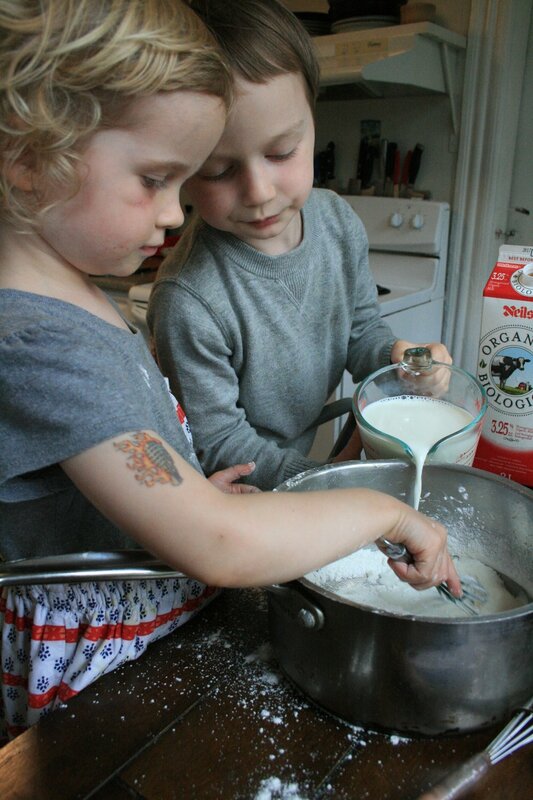 Any recipe that involves whisking is a hit with kids - and of course, this one also has chocolate. 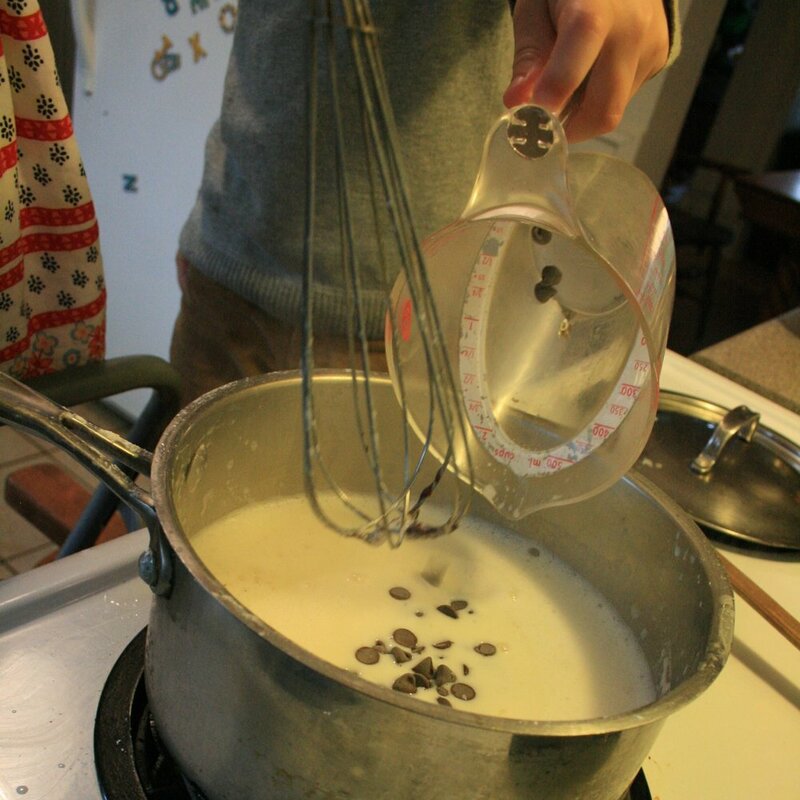 The kids had a great time pouring and mixing, and then adding the chocolate to the warm milk on the stove. Ladling the finished pudding into ramekins and bowls was exciting, too. We don't have dessert very often, and sweet snacks in our family are kept to a minimum and only offered mid-afternoon (instead of after dinner when we're trying to get kids to calm down). The promise of chocolate pudding was thus a real treat. 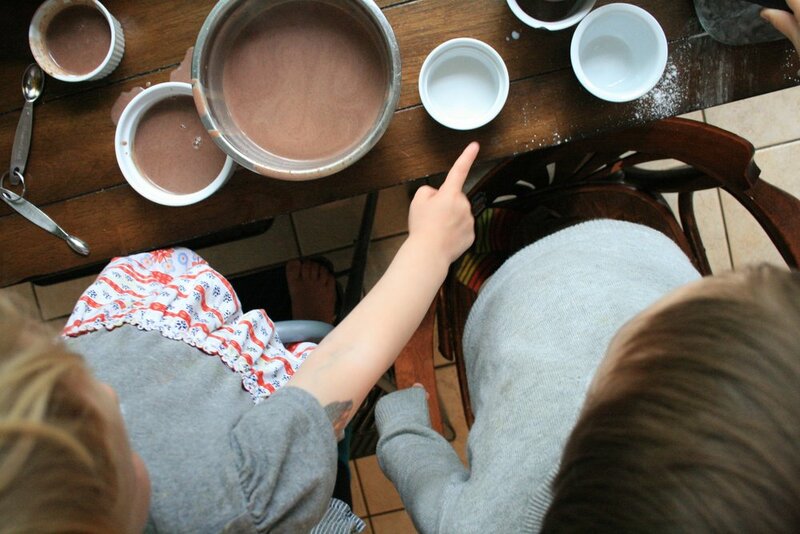 And the kids didn't mind when it didn't set - chocolate soup tastes delicious, of course! But I'll be trying the recipe a second time, and involving them again. We'll talk about how it was different from the first time, how we changed the process, and which one did they like better? When you're cooking - either with kids, or without! - sometimes you just have to try recipes more than once.